The ride to this high ski lodge can be made into a two-way summit (two separate approaches) with the help of a low traffic, yet completely paved ski area service road. Once on top you are are about equally distant in elevation from Portland as from the top of the Mountain. You can't see Portland, but the the view of Mount Hood is a big attraction. From West. 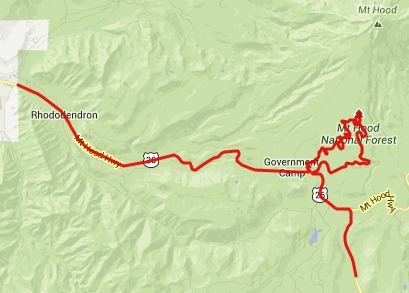 It's hard to decide where on US26 to start this profile, so I'll start it where my ride turned onto US26, the junction with East Lolo Pass Road, also the way to Lost Creek campground, and a whole world of trailheads into the Mount Hood region. I found riding on US26 to be very unpleasant. The reason is the noise. Any highway where most of the space is occupied by moving cars is going to be noisy. But this one seems to be much worse. Maybe it's the lack of curvature, so that every driver feels obligated to press on the gas pedal till the speedometer reads the speedlimit. Maybe it's the weight of all the contraptions that these climbing vehicles carry behind them, boats living spaces with grey and black water tanks that need to be emptied ... Maybe it's the proximity of Portland that makes traffic heavy. Actually, it's probably all of these. That being said, this is a perfectly save and civilized ride on a spacious shoulder. And Oregonians on the west side of the Cascades would never think of putting a rumble strip down the middle of it, like they do in barbarian states like Nevada, Montana, Utah and Colorado. And maybe I just hit a very popular traveling time also, a late Sunday when Portlanders take the first step of returning to work, race back home to get some sleep. The second time I rode down this road on a Wednesday evening wasn't nearly as bad. One way I found to get away from the traffic for a while was on a side road labeled "Kiwani Camp". After several miles it dead ends, but a section of abandoned highway, now closed to cars leads back to the main road through a canopy of green. Coming the other way it's possible to find this trail directly behind the sign reading "Truck Runoff Ramp 1 mile". Now fortified by half an hour of peace and silence I braved the remaining miles to the turnoff to Government Camp Village on US26. It's not necessary to ride the short detour through this skiing village, neither is it very scenic. But the next turnoff up West Leg Road is not exactly easy to find, and the lady in the information office (clearly labeled as such on the east end of town) was happy to repeatedly give me detailed descriptions on how to find it. Actually it does not sound difficult. Basically it's the first left after one is back on US26, and then the next immediate left (unsigned) after that. This narrow isolated road, named West Leg Road, traverses across ski runs up the lower slopes of Mount Hood. The peak is visible once in a while, looking up the ski runs. This section is the best part of the workout and it ends where the ski run road terminates on Or173. From here Timberline Lodge is just a minute away, Here OR173 begins its top section, a one way loop with the lodge at the top. So this route is a two way summit that does not double back on itself, but it does cross over itself. Timberline Lodge is an old historic ski lodge with interesting art work and unique architecture, and also some great views at last of Mount Hood, from north of the lodge. The size of the parking lot up here is measured in football fields. From East. The rider speeds past the "breadth recovery zone", where West Leg Road ended, heading down the forested slopes along Or173. The view below is of green hills in a haze with a singular lonesome lake nestling in them. There is a good shoulder, but heavy and unpredictable traffic, including a noxious smelling diesel bus from the ski lodge. Or173 rejoins US26 just a few hundred yards from where West Leg Road diverted from it. If having come up that way for a day long ride, the return will most likely also go back down it. But in order to show the climb from the other side the profile goes south on US26 to a low point, before it climbs again up to Wapinitia Pass. Timberline Lodge: Mount Hood s(u) , FR1828 Lolo Pass , Lolo Pass : Mc Neil Campground area > up East Lolo Pass Road > Lolo Pass <> out and back down 340ft the north side of Lolo Pass > down FR1528 > FR1528 Lolo Pass s(u) > down East Lolo Pass Road > US26 east > Rhododendron > Kiwani's Camp/ Barlow Campground Rd > back onto US26 east > Government Camp > up West Leg Road > Timberline Lodge: Mount Hood > down Or173 > US26 west > up East Lolo Pass Road > back to starting point: 67.3miles with 7570ft of climbing in 6:03hrs (VDO MC1.0 r2:13.8.11). Notes: this was not the planned route for my road bike, but the north side of Lolo Pass was not paved and too rough for this bike. Without this short section on Lolo Pass this makes a great paved route, preferably during a time when US26 traffic is lighter. It was a near perfect day, if it weren't for a leaking tube on the last part of US26, which made for a slow and soft return.